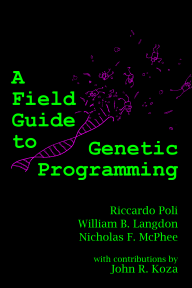 A Field Guide to Genetic Programming (ISBN 978-1-4092-0073-4) is an introduction to genetic programming (GP). GP is a systematic, domain-independent method for getting computers to solve problems automatically starting from a high-level statement of what needs to be done. Using ideas from natural evolution, GP starts from an ooze of random computer programs, and progressively refines them through processes of mutation and sexual recombination, until solutions emerge. All this without the user having to know or specify the form or structure of solutions in advance. GP has generated a plethora of human-competitive results and applications, including novel scientific discoveries and patentable inventions. The book is freely downloadable under a Creative Commons license as a PDF and low cost printed copies can be purchased from lulu.com. This web site will be used for information relating to the book, and other pertinent announcements. We also have a discussion group for questions and conversation related to the book. Many thanks to Muhammad Atif Azad, who thoroughly analysed TinyGP.java, the sample GP implementation in one of the appendices of the book, and uncovered another important bug. This bug does not crash the system, but it means that the parameter CROSSOVER_PROB is interpreted as the mutation probability rather than the crossover probability (its intended purpose). We had found and cured this bug some years ago in the C version of TinyGP, but it somehow made it into the Java version (probably because I did the conversion before the bug had been found). My most sincere apologies to any users of this system. Get a copy and cite the book!!! Download the PDF for free from Essex! Download the PDF for free from UCL! Buy a printed copy at Lulu!